Fully separated cycle and pedestrian routes on all arterial roads. The meeting was also attended by Andrew Burns, City of Edinburgh Council Leader (who reported it on his blog). The last question Councillor Burns was asked was whether he could remember the first recommendation on the list, but he could not. Which I think encapsulates the problem neatly. The first recommendation is for separated cycle routes, as found in Copenhagen, Amsterdam, and elsewhere. 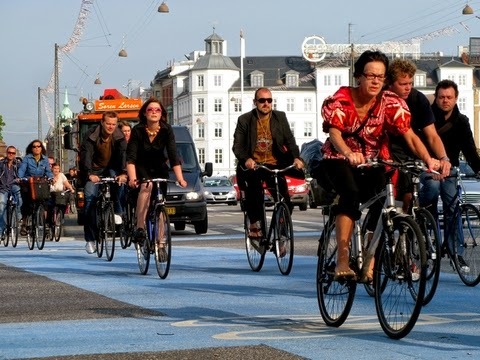 ("Copenhagenize" is now a verb.) To Edinburgh's credit, it has allocated 7% of its transport budget to cycling. How much of that is going to separated cycling routes, and the other recommendations on the list? Councillor Burns says segregated routes are planned for George Street and Leith Walk. I argued we need a more agressive plan. Listening to Pooley, the problems sound difficult, but all we really need are the money and the will. Let's construct a network of separated cycle routes covering the city. Build it, and they will come!